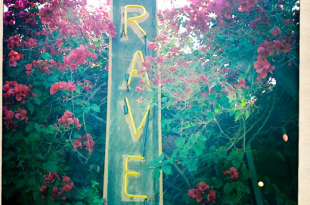 Blooming with exotic, multicultural treatments, the spa menu at Cote d’Azur caters to spa junkies, cultural creatives and what this writer likes to call “the working stressed.” Many yogis belong to this evefactr-growing legion of people. Perhaps you do as well. The people at Cote d’Azur understand the health needs and budget issues of the working stressed; this is why their menu brims with smartly packaged treatments utilizing diverse elements designed to help heal 21st-century souls. Fact is, Cote d’Azur delivers profound revitalization at fair prices. Take for instance their 15-minute massage: The Tea Break. It costs $25 and is designed to instantly relieve shoulders, neck, hands or feet and get you back to the office, or car, in fine form. 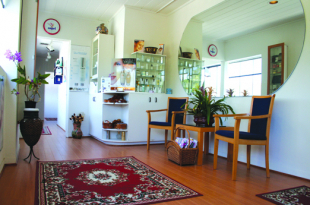 Other time-sensitive and schedule-savvy treatments include Lunchtime Reflexology, which is available weekdays between 12 and 1 pm and costs $70 for 25 minutes or $95 for 55 minutes. 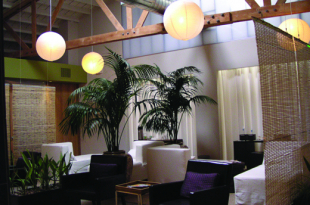 Unlike the vast majority of SoCal day spas, Cote d’Azur embodies a sophisticated Bohemian healing purpose and atmosphere. Gleaming wood floors, simple Asian and Indonesian-sourced furniture, candles, objets d’art and soothing lighting create a zone that feels simultaneously 1966 and 2006. 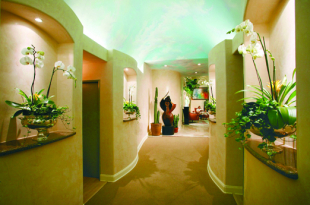 Cote d’Azur is a classic, ageless kind of place that excels at creating and providing idiosyncratic spa experiences. To wit: guests can regroup in the “relaxation room.” For $20, a person can come in and unwind for up to two hours if they are feeling stressed, dealing with menstrual cramps or just in need of a place to chill. It is self-serve, but will provide access to aromatherapy, sound baths, hot rice packs and vitamin water. It is open to men and women, and is designed for people to use their challenging times for tuning in and using their energies to regain individual and community balance. If you have the time, money and inclination to receive multiple spa treatments in one fell swoop, then sign up for one of Cote d’Azur’s packages. 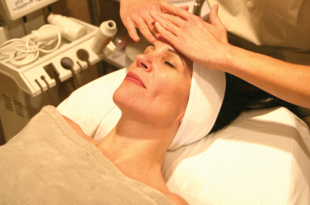 All of these offer multiple services in a two-hour period. Standouts include the “Escape to Bombay,” which lulls the senses with warming spices and costs $199. Featuring a full-body loofah or salt treatment with cardamom-clove essence, this treatment promotes optimal circulation and warms up muscles and limbs on chilly days. (This is also an energizing and balancing treatment for PMS and hangovers.) Followed by a full body massage for rehydration, the Bombay incorporates a natural stone foot treatment with intensive hand hydration and a cleansing facial.Looking for a more energetically focused experience? Then try “Escape to Macchu Picchu.” At $180 for two hours, this intensive energy treatment and cleansing involves hot and cold stones, custom aromatherapy, vibrational toning and a salt scrub. 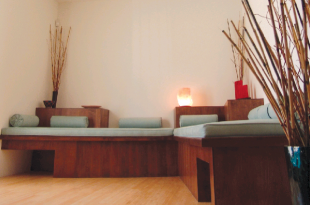 In effect, this treatment helps rebalance and retune the mind and body. Should you lack the requisite time and money for one of the packages, go for the Mud or Herbal Wrap; this comforting, cocooning treatment will remedy physical and emotional stresses in about an hour, while costing $75. This full-body wrap with either steamed flowers and herbs or mud from the Dead Sea heats, soothes, softens and detoxifies skin while replenishing your being with moisture and earth elements. Massage lovers are advised to book The Indigo. Combining Swedish deep tissue, hot stone, pressure point and energy therapy to relieve muscle tension and return the body to contented equilibrium, this is the treatment to book on a Friday after work or first thing on a Saturday morning. The minimum-length Indigo costs $50. A full runs $75 and the deluxe-length version costs $95. Another notable way in which Cote d’Azur services their clients concerns their seminar programming. The majority of spas are mainly concerned with making as much money per square foot that they can manage. 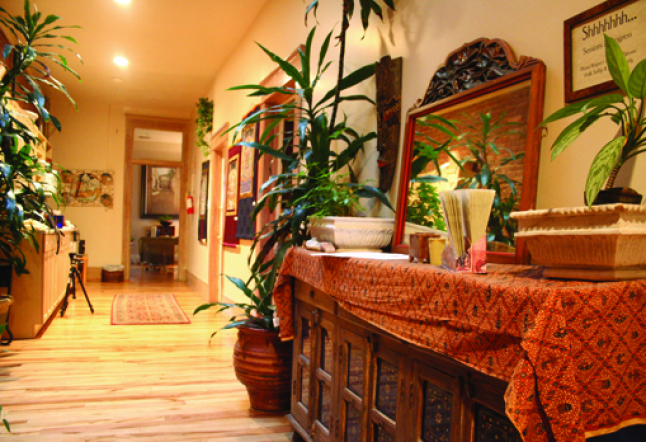 This gem in the heart of Old Town Pasadena seeks to educate and expand awareness by offering low-priced, and in some cases, free workshops on health topics such as acupuncture, vibrational toning, aura photography, music therapy and Native American full moon ceremonies. So Cote d’Azur is more than a day spa; it is also a gathering place for people to learn and share knowledge about health and self-care so that the working stressed can learn how to become the working blessed.